Hearts of Oak gaffer, Kim Grant has reiterated that he was not appointed to win trophies. The former Ebusua Dwarfs technical director took over the head coach of the club last year and he was handed a three-year mandate to lead the technical team of the Phobians. 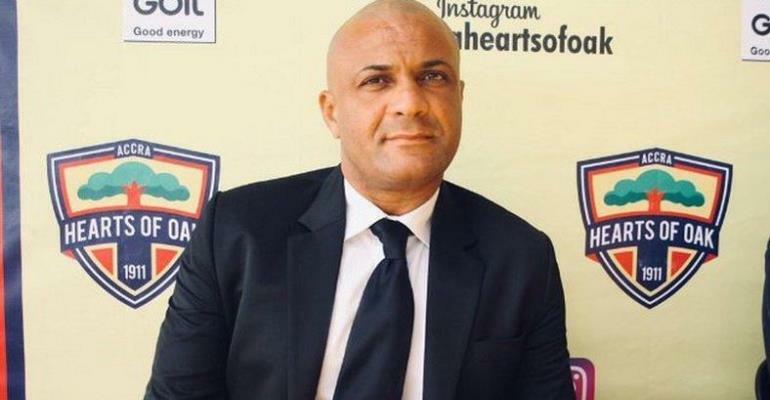 Despite the team's heroics, the former Ghana international says he has no mandate to end the club's trophyless run but insisted he has personal motivation to leave a legacy at Accra Hearts of Oak, so his quest to win silverware. "I have got 3-year mandate. I have not been given anything to win so it ends there," he told Oyerepa FM. "After the third year, hopefully, we will be in a CAF Competition but again it's about now and not the future,” he added. "Not at all, Not at all but I challenged myself," he said. "I didn't come to Hearts of Oak to be on holiday, but to be successful,"
"I didn't come to the biggest club in the country just to be sitting in my desk and just training, I came here to win things." "Whatever the board and others wanted, of course, they want to win everything, they are not "stupid", "am not stupid", am here to win things for Hearts of Oak and I will be judged on results," he concluded. The Phobians will take part in the Normalisation Committee special committee which begins this week.